As we reach the longest night of the year, there is nothing quite like a cruise to blow the cobwebs away and lift the spirits. Conventional wisdom used to be that winter cruising was for the idle rich and the plushly aged. 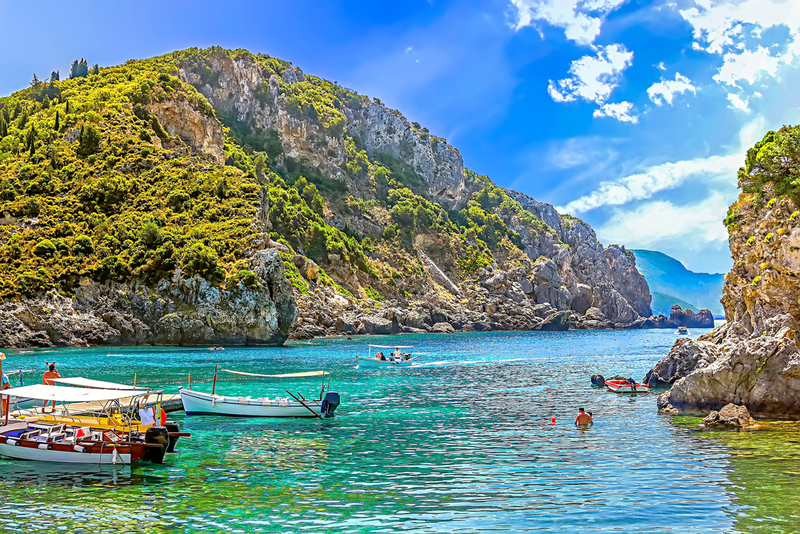 With an increasing armada of ships visiting sun-kissed regions in winter months, last-minute cruise bargains are not limited to the January sales. Now, more than ever, a sea-borne escape from dark days is an affordable indulgence. Getting a winter tan, absorbing some local culture, and recharging the batteries – these are all part of the heady cocktail on offer in many popular cruising playgrounds. But where to choose? Follow Gary Buchanan to the hottest hotspots. 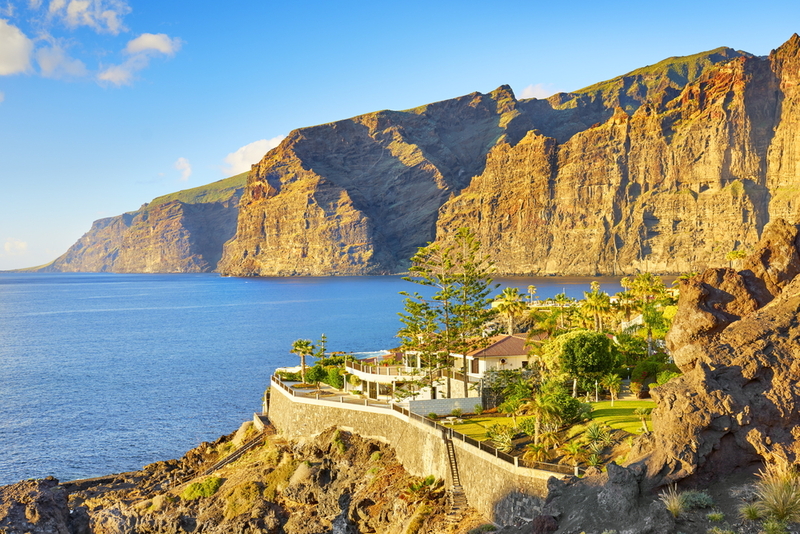 It’s easy to see why the tranquil island of Madeira is referred to as the ‘Garden of the Atlantic’ – especially so when it basks in winter sunshine. The capital Funchal overflows with baroque greens-huttered buildings edged with lavender jacaranda blossoms. Visit the Se (cathedral) with its Moorish-inspired ceiling of carved cedar wood and ivory as well as the Quinta de Cruzes Museum. From Monte take a ride on the unique carros de cestos (toboggans). Rolling sand dunes are a feature of Gran Canaria; in Las Palmas there’s the chance to visit the Old Town with its Gothic Cathedral and Columbus Museum at Casa de Colón. There are a variety of options to explore off-the-beaten-track villages of Arucas and Teror; Casa Romantica in San Pedro; and the hidden caves in the Barranco de Guayadeque. From Arrecife on Lanzarote take a camel ride around Montaña del Fuego in the Timanfaya National Park where Islote de Hilario smoulders with a scarlet glow. 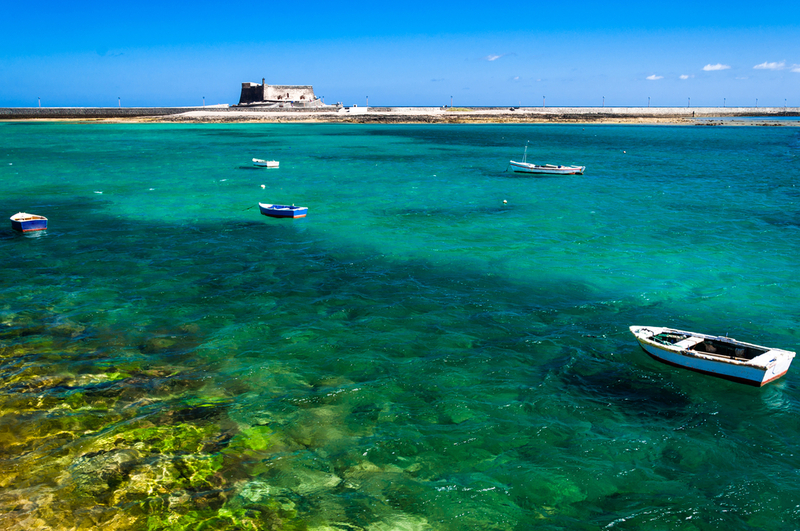 The Green Caves and the emeraldgreen lagoon at El Golfo are also worth visiting; as is the Mirador del Rio; and 16th century Castillo de San José, home to the Museum of Contemporary Art. Santa Cruz de la Palma is considered to be the prettiest town in the entire Canary Islands. The Caldera de Taburiente National Park is one of the most impressive volcanic craters in the world; recent eruptions in Cumbre Vieja occurred in 1949 and at Teneguía, in 1971. Tenerife is the largest of the seven Canary Islands. In the captivating capital of Santa Cruz important sights includePlaza de España; the futuristic Tenerife Auditorium; the 16th century church of La Concepción; and the 18th century San Francisco Church and Convent which houses the Municipal Museum of Fine Arts. Alternatively there are tours to Mount Teide in the Esperanza mountain range. Agadir has been called ‘Miami of Morocco’ thanks to its expansive beach, but there’s more to this modern town than a flawless beach; see the Vallée des Oiseaux – a dry river gully with an aviary and zoo; or the ruined Kasbah, perched on a hill. Also on offer is a day-long excursion to the Arabian fantasy that is Marrakech where you can haggle for bargains in the myriad of souks. In ancient times Cyprus was dedicated to Aphrodite, goddess of love. Due to its strategic location, a long list of invaders has occupied this mountainous island including the Phoenicians, Assyrians, Egyptians, Romans, Venetiansand British. From Limassol on Akrotiri Bay there’s the chance to visit the ruins of Kolossi Castle, where King Richard I of England is supposed to have honeymooned with Berengaria in 1191. Not far from the port lie the ruins of the 11th century BC Mycenaean colony of Curium and the ruins of Amathus, founded by the Phoenicians in 1100 BC. Recent political upheavals have made Egypt a less appealing prospect, but the intrepid can still head for Alexandria, the site of the Pharos Lighthouse – one of the Seven Wonders of the Ancient World. Principal sights include the Græco-Roman Museum, the Roman Odeon of Kom el-Dikka, the Kom el-Shogafa Catacombs, and Pompey’s Pillar. When it comes to sunbathing, scuba diving or shopping, Sharm El Sheikh’s got it all. Renowned the world over for its fine beaches, snorkelling and scuba-diving are particularly popular in the warm waters and coral reefs of the Red Sea. 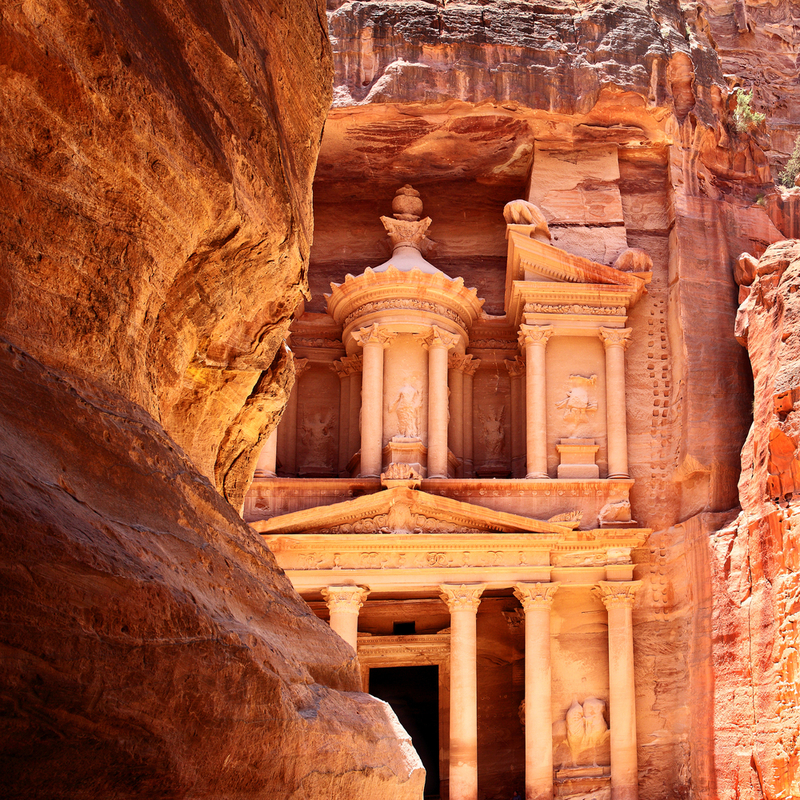 A day-long excursion from the port of Aqaba takes you to Petra – considered by many to be the ‘Eighth Wonder of the Ancient World’. Gleaming rose-red in the radiant sunshine, breathtaking buildings constructed by wealthy Nabataeans in 400 BC rise out of Jordan’s vast desert like a shimmering mirage. The city’s masterpiece, featured in the Indiana Jones film ‘The Last Crusade’, is the hauntingly beautiful Treasury. Throughout the world there are groups of islands caressed by gentle winds, ringed by white sandy beaches and glistening iridescent waters. But nowhere in the world is there a cornucopia of islands quite like the Caribbean – a collection of 7,000 differing islands, set in azure seas, each with their own culture and style, activities and ambience. Aruba is ‘One Happy Island’ or so the slogan on every license plate says. 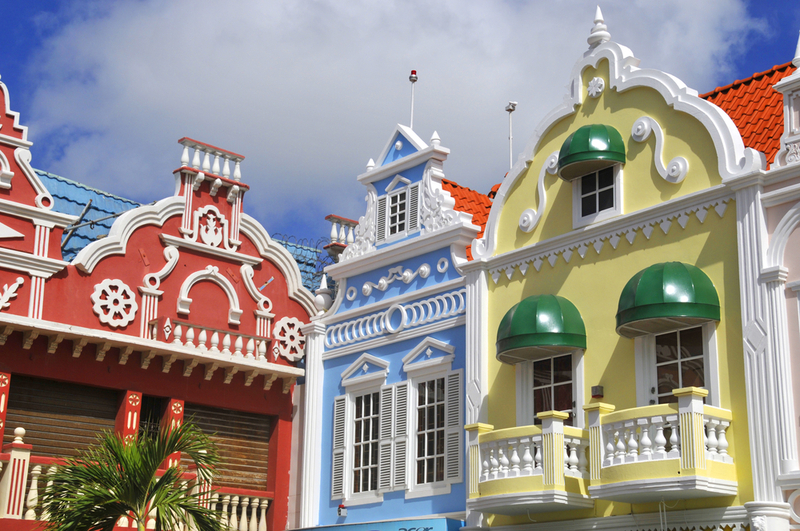 Wilhelminastraat, in the old quarter of the quaint capital of Oranjestad, quickly reaffirms the strong Dutch links with this Caribbean outpost. Tall, narrowgabled, 18th century houses with red-tiled roofs painted in cool pastel shades juxtaposed with intense yellows and royal blues conjures up images of a fairytale Amsterdam. Barbados is an infectiously happy island with an embarrassment of luminous cyan-and-white beaches along the Platinum Coast. Rum rules in Barbados and over the centuries, cane plantations have divided the Bajan landscape into a pretty patchwork of fields. George Town, capital of the Cayman Islands, has one radio station, one traffic light and over 440 banks. It’s this status as a British Crown Colony and tax haven that is prized by offshore companies, but cruise passengers head for Seven Mile Beach for some serious lotus-eating. 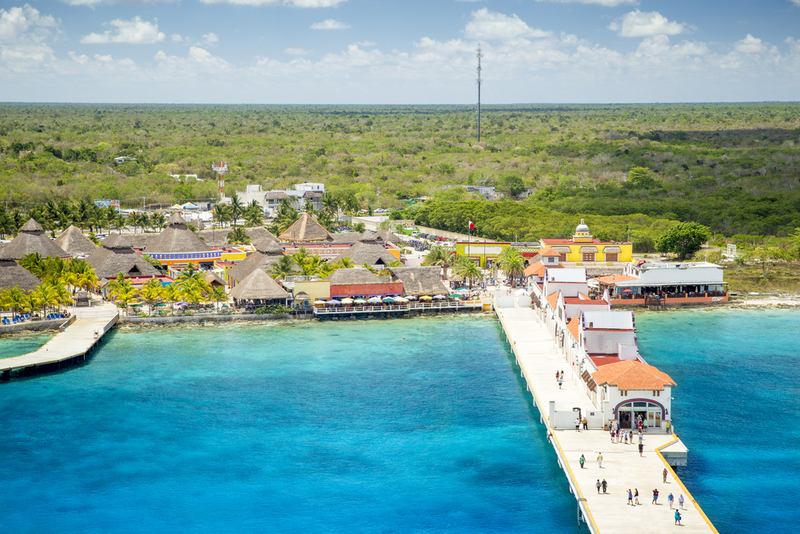 Cozumel lies just a few miles off the Yucatan coast. For centuries it has seduced adventurers from the Mayans to Cortez as well as pirates who found sanctuary in its hidden coves. Today it attracts divers and sun-worshippers. Visitors to Chankanaab National Park can snorkel amongst black coral, anemones, and enormous yellow sponges in a unique saltwater lagoon. In Curacao there’s the chance to explore remnants of Spanish and Dutch settlements; visit Willemstad’s charming streets and alleyways; or take a tour to Mt Christoffel and explore the Hato Caves, whose remarkable carvings date back as far as 1,500 years. Grenada has more spices per square mile than any other place in the world. Turbaned ladies manning quaint market stalls along the bustling waterfront, sell fragrant cloves, cinnamon, ginger, and nutmeg. The port of St George’s is a confection of narrow, steep streets, wrought-iron balconies and charming pastel dwellings. Martinique’s capital Fort de France, with its quaint streets and curious Creole architecture, is reminiscent of the French Quarter of New Orleans. A Gallic way of life and Afro-Caribbean cultures have blended to produce and intoxicating mix. A café-au-lait is de rigueur before taking a stroll to Sacré-Coeur – a scaled-down replica of the famous Paris landmark. Nassau’s Main Street bristles with serious shoppers but most tourists head to Paradise Island and the surreal resort of Atlantic – a vision of what the Lost City would be like if someone pulled the plug on that fabled ocean metropolis. St Lucia’s pitons rise to more than 2,400 feet. These volcanic peaks are synonymous with this island of lush green valleys, acres of banana plantations, and bubbling sulphur springs. Pigeon Island National Park, a 40-acre island connected to the mainland by a causeway, was once a pirates’ hideaway and makes for a fascinating exploration. Sint Maarten/St Martin is half Dutch, half French with only a small road sign indicating you have passed from one country to another, but the contrasts are marked. Marigot, on the French side, is small and chic – a vision of St Tropez in the Caribbean, lined with boutiques and bistros. Philipsburg on the Dutch side features Front Street, whose gingerbread buildings house excellent duty-free shopping. St Thomas’s license plates proclaim ‘American Paradise’ – not surprising then that Magens Bay Beach on the north coast is considered to be among the top ten most beautiful beaches in the world. Shopping in Charlotte Amalie attracts ladies in search of emeralds, diamonds and sapphires, while men carry off large packs of duty-free liquor and cigarettes. English Harbour in Antigua is quintessential Caribbean and a visit to the restored Nelson’s Dockyard should not be missed. Similar images of Spanish colonialism are on offer in San Juan where the exquisitely preserved Old Town, founded in 1520, is a pastiche of sprawling forts, cobblestone streets, antique shops and galleries.